Look at GPCR drug discovery from a whole new angle! GAP proteins stimulate the GTPase, which is detected as an increase in GDP formation using the Transcreener GDP GAP Assay. For RGS activity, the required protein and detection reagents are available from BellBrook for purchase or as a service. A Complete Screening and Profiling Solution: Recombinant RGS proteins and kinetically enhanced Gα proteins are available. Contact us for more info. 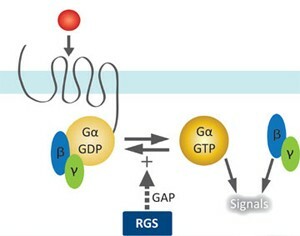 The most direct way to detect RGS function is by measuring the increased GTPase activity of the associated Gα protein. However, the GTPase activity of isolated Gα proteins is limited by GDP dissociation, so RGS GAP activity is difficult to measure using simple biochemical assays. Use your own GAP protein or overcome this kinetic constraint of RGS function by using proprietary Gα protein variants with altered GTP hydrolysis and GDP dissociation rates that enable detection of RGS GAP activity using the Transcreener® GDP Assay. Members of the “regulator of G-protein signaling” (RGS)-protein superfumily act as “GTPase-accelerating proteins” (GAP) for heterotrimeric G-protein alpha subunits, thereby attenuating GPCR signaling. Their selectivity for specific GPCRs and downstream signaling components and their tissue-specific expression makes them attractive as potential therapeutic targets, with the potential for modulating the effects of existing GPCR agonists.